We spent 2 weeks travelling in Cambodia in April 2015 with our friends Jess from the UK and Johan from France. We started in the capital city of Phnom Penh where we discovered a very exciting gay scene with local boy Aaron. 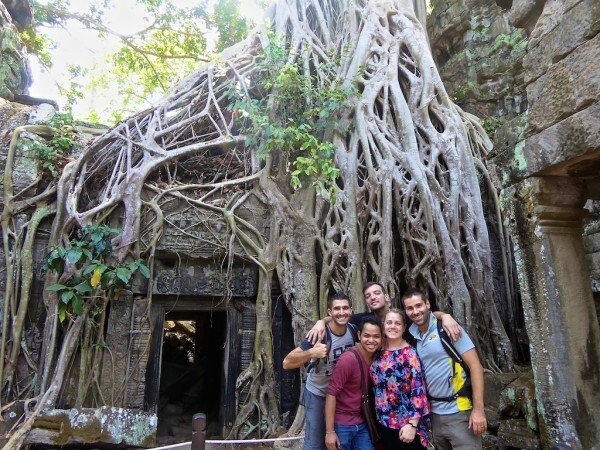 We then headed to Siem Reap to explore the world famous temples of Angkor Wat. In Siem Reap we also saw the excellent Phare Circus and got quite involved in the water and talcum powder throwing during the Khmer New Year celebrations around Pub Street. We finished our Cambodian travels exploring the beaches around Sihanoukville. Otres Beach was our favourite: peaceful, few people and a great base to take a tour to visit the surrounding islands. Our Cambodia travel video was made using the video editor “MAGIX Movie Edit pro 2013″. The music used is the instrumental version of “Rather Be” by Clean Bandit featuring Jess Glynne. Read more about our favourite observations of Cambodia and our favourite Khmer foods.